Many websites, companies and organisations offer them to subscribers of newsletters or regular site visitors. This article will describe why they give them away and list sites where you can easily obtain free cinema tickets to Cineworld, Vue and Odeon. In some cases the preview will be to watch the latest films for free. This means you get to see the film or cartoon a week or two before the general release. This gives the manager or the film producers a chance to market research the film, see how popular the release might be and watch the audience reactions to various scenes and endings. For example if the offer is a sell out and many people have applied for the free cinema preview ticket then they know it will probably be a popular movie and they can allocate screen time accordingly. Other incentives for offering them may be to trial various endings of the film to gauge audience reactions. At other times you may be offered free movie tickets to pre advertise a new movie release so that the advertising causes media interest in the film. By offering it the company have created a viral campaign which gets internet users creating a round robin chain letter type of e-mail where they tell their friends and relatives about them in cities like London, Manchester, Birmingham, Newcastle, Edinburgh, Glasgow - well you get the idea - ask them to tell their friends and it will soon circulate throughout England, Scotland, Ireland and Wales. A cinema free ticket preview screening is slightly different in that you may be asked to fill out a small survey or questionnaire before and after watching the film. You may also be asked to view different scenes of the film, shot in different ways or having differing plots. You will then be asked your opinion of the film and the various scenes. So during the cinema free preview screening you still get to watch the entire film with the added advantage of seeing alternative scenes and ending of which goers would have to wait for the DVD release to see these scenes, if even added to the DVDs. Other companies will offer them as a service to their customers, to gain new subscribers to a newsletter and to retain the newsletter readers. In the same e-mail there will be other site or company news and maybe an advert or two. Sadly there are some cons. There are several scams such as webmasters who build what appears to be genuine websites offering them in exchange for you clicking on advertising links or affiliate links for which they get a commission when you take out a credit card or join a site as an example. Unfortunately they are happy to take your money and may never even send you out the gifts. Avoid these scams by only visiting such sites if recommended by a reputable source (like findextrawork!) or a friend or relative have used them and received the items. 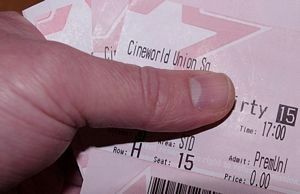 Other ways how to get cheap cinema tickets is to work as a cinema mystery shopper. There is general information about being test shopper on our mystery shopping jobs page. Examples of companies that pay you to go cinema mystery shopping is Lodge Service and React. Generally you have to go to 30 minutes before the film starts, assess the area and stocks of sweets, drinks and food. Look for specific advertising to ensure it is being displayed. You then may have to introduce yourself to the manager who will provide you with entry. You then have to complete some paperwork about the adverts being shown just before the film and then the rest of the time is yours to enjoy the show. You may even have to make a test purchase of popcorn, a drink or a hot dog to assess the quality of the food and the service provided by the staff. All this and you will get paid anything from £5 to £15 and be able to claim travelling expenses like your mileage, parking or bus fare. As most of this type of work will be in the evening you can combine it with your day job as an extra source of income. Okay so now you should know the advantages and disadvantages so you probably want to know where to get them! Here are a few websites and places and for some of the services you may need to subscribe to a newsletter which is usually weekly. This does save you checking back to the website and you will get notification of the latest ones and should get to the offer much quicker so stand a better chance of getting them. You may need to print off a webpage or receipt whilst other sites will e-mail you details that need to be printed. In most cases you simply then show this to the usher for entry. This saves the website postage and the cost of printing special ones and means you get it there and then. Seats can be allocated and the offer can close as soon as all the seats are filled. Sadly though it is never full at these free screenings because people decide not to go but do not pass their cinema ticket freebie onto another person. So our tip for applicants is to only apply for it if you know you will definitely be able to go and enjoy the show. If not leave it for someone else to apply for it and make use of the limited seat. If you have some on offer that you would like listed then please add out link to your website and then contact me. I hope this page has been of use and that you will enjoy them and have a welcome rest from work. If you like the idea of getting more things for nothing then visit our Freebies page for more information.